When most people think of self defense weapons, especially in this day and age, their thoughts no doubt turn to guns. Guns seem to be everywhere in our society—almost always playing a role in the leading stories of the day. However, in certain cases, a knife is not only just as effective as a gun, but perhaps even more advantageous for self defense situations. There are many benefits to carrying or using a knife for self-defense, many of which we will feature in the article below. We will also talk about when it is reasonable or appropriate to draw a knife for self defense; and show you the proper way to defend yourself using this implement. Finally, we will compare and contrast the benefits and drawbacks of the two main types of knives: fixed blade knives and folding knives. When Is It Appropriate to Draw a Knife in Self Defense? Before we go into the many useful benefits of carrying a knife for self defense, we believe it is important that you have at least a basic understanding of how to use these weapons should a dangerous situation present itself. The phrase “self-defense” when speaking about knives is a bit of a misnomer. That’s because in order to “defend” yourself against a would-be assailant, you will almost always have to use the knife in an offensive manner. Unless the assailant freezes and runs at the sight of your blade, you will need to use it offensively, and this action is not an easy one to take. To act in self-defense using a knife, it is crucial that you are properly trained in using the weapon. You will need to know how to stand, how to hold it (so it doesn’t get taken from you), etc. And while this guide should help a little from a knowledge standpoint, you will still need extra practice under the leadership of a qualified self-defense professional. Many martial arts and self-defense classes teach people how to handle a knife for self-defense. Additionally, if you have access to anybody in law enforcement or especially those with a military background who wouldn’t mind teaching you, that would be great. Military personnel, especially those that have seen combat, are trained extensively in this area and can be a great resource. Despite what you see in the movies, there is nothing glorifying or dramatic about using a knife for self defense. However, if you are in fear for your life from someone attacking you the last thing you need to think about are the consequences—what might happen in the aftermath; you must fight for your life or risk losing yours—and a knife is a great place to start. Now let’s take a look at the proper knife grip. There are two basic grips when it comes to using a knife for self defense: the forward grip and the reverse grip. With the forward grip, the tip of the knife will point upwards, toward the sky. Conversely, with the reverse grip, the tip of the knife will angle downward, toward the floor. Martial artists and self-defense trainers have different opinions on which grip is best. For stabbing someone, the forward grip is usually the go-to way to handle the knife. While the reverse grip is typically used for slashing at the assailant from side to side. Most people in the know—the experts—believe that the best grip for an individual is the one that feels most comfortable and stable to them. For example, if the forward grip feels truly awkward and unsteady in your hand, you may want to reverse the grip. Again, comfort and stability—knowing that you will be able to hold onto the knife throughout the encounter—are the key factors in your grip. Just make sure that all five fingers remain on the knife at all times, and that your grip is very strong. There may be instances in a self-defense encounter that you will have to draw your knife very quickly. Because of this, it’s important that you practice (and practice and practice) the act of drawing your knife with the grip you plan to use. Keep doing it until the movement feels very natural and automatic. You should also prepare for instances in which you may have to pick up your knife from the ground. In these situations, it may be impossible to achieve your most comfortable grip, which is why it is crucial that you practice both types of grips—preparing yourself to use any one of the two grips should the need unfortunately arise. Not all knives are made the same, which is why it’s important that you choose one that is the right weight and size for you—factors that will determine how you hold it. There are many factors to consider when selecting a knife—and a grip: the size of your hand, the length and spacing of your fingers, etc. When you hold the knife, you want to make sure there are no sharp corners or pinch points that might make it uncomfortable to use in a self-defense scenario. Moreover, be mindful about knives with pre-grooved spaces on the handle for your fingers. These may seem like a nice addition, but if your hand doesn’t properly line up with the grooves it will be basically unusable for you. When using a knife for self-defense, the position of your body will probably be dictated by the movements of the assailant. As he moves toward you, you will move back, and vice versa, all while being careful to remain out of his offensive striking range. As a general rule, though, you will want to stand comfortably with your feet about shoulder’s width apart. As you take this stance, try to keep most of your weight on the balls of your feet—as if you are ready to spring into action—because you are. The last thing you want to do is caught flat footed in a fight, or even worse, rocking back on your heels. This gives your opponent a distinct average in terms of balance. For a reference point, think of the stance a boxer takes when fighting in the ring. His or her feet are always spread out at a comfortable distance and balanced; and the feet are always moving or ready to move. Moreover, the boxer stands a bit sideways, giving his opponent the least amount of himself to hit. This is also a good rule of thumb for your scenario. If you are forced to use a knife on someone, try to do so without opening yourself up to punches or strikes from his weapon. 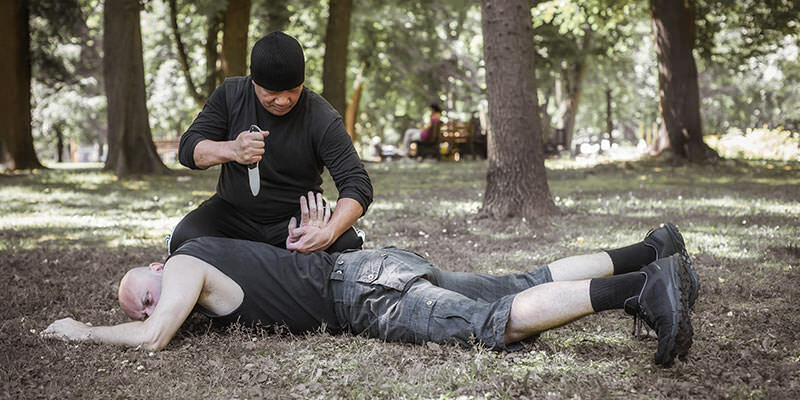 One of the best ways to become proficient when using a knife is to practice different grips, stances and angles of attack on a life-size dummy, cardboard cutout or even a heavy bag. Keep in mind that the main goal is to have your attacker flee due to your “offensive” behavior; or to totally incapacitate him and thus end the fight. By practicing different angles of attack, you can get a good feel for which knife strikes seem natural, strong and steady, and which ones feel less than strong and thus may compromise your ability to keep possession of the weapon. Although in a self-defense scenario the scene can be chaotic and frantic—perhaps causing you to swing your knife indiscriminately—if you truly want to incapacitate an attacker quickly with a knife, it’s important you aim for sensitive, high-pain areas. These include the eyes, the nose, the ears, the face and, of course, the groin. Use your knife in combination with other physical strikes for best results, and never go to the ground unless absolutely necessary. Almost all the experts, from those in law enforcement to military trainers, agree that, in some cases, a knife is a much more effective weapon than a gun—which also makes it a very good weapon for self defense. There are many benefits to using a knife for self defense, and here we will name some of the top advantages to help make that point. There’s a rule in the annals of law enforcement that aptly describes the benefits of using a knife in close quarters combat—it’s called the 21-Foot Rule. Long used by police officers, the 21-Foot rule says that when a person is inside of 21 feet and moving forward toward the officer, it is nearly impossible for him to draw a firearm and shoot before the attacker makes contact. Now keep this in mind: if a highly trained law enforcement officer does not have time to draw a gun in this situation, neither will someone with very little to any training. It would be improbable at best and impossible at worst. Because of the 21-Foot Rule, law enforcement officers are now being trained to use other weapons to deal with close-quarter assailants, including knives. This also applies to combat soldiers, whose hand-to-hand combat training includes skills with knives in an up- close fighting scenario. Guns are only effective weapons when the assailant is in the line of fire. And by firing a gun, a person might risk hitting an innocent bystander. This is never a problem with a knife. Knives can only be used when the assailant is directly in front of the person defending themselves, and there is rarely any risk to the general public. If you watch a lot of TV or movies, you already know that when the bad guy shoots, he always misses, but when the good guy shoots he is always right on target and gets his man. Right? Actually, that is hardly ever the case. In an attack of some kind, when the assailant is moving forward and you are trying to fend him off while simultaneously pulling a gun, chances are you may not even have the opportunity to draw your weapon. And if you do, there is a good chance you will miss. Again, this is not a concern with knives. The major advantage of using a knife for self defense is that these weapons rarely miss—they almost always hit their intended target. It’s a funny thing, but knives hardly ever seem to run out of ammunition. In fact, they never do. Why? Because there is no ammunition with a knife, save for your hand, a steady aim and some clear resolve. In an extended foray—when you are fighting for your life—guns can run out of ammunition and put you in a very precarious and dangerous situation. Meanwhile, a knife is always loaded—no matter how many times it is used. Those who purchase a gun for self-defense have to go through a variety of steps before they can take ownership and get licensed to use it. Assuming the person does qualify for a gun purchase, he must have the gun registered, and get certified to carry it. He or she also must practice at the gun range to learn how to shoot it, and go through a lot of steps to clean the gun every so often. On the flip side, those who buy a knife for self defense are done with their process the minute they take it up to the register. Sure, there may be a little practice involved to learn how to grip it and use it for self defense. But there is nowhere near the effort with knives as there is with guns and some of the other self-defense weapons out there, including tasers and mace. Guns make a lot of noise. But with a knife you will have the element of surprise on your side. Nobody sees a knife coming. You can wait until your attacker gets to within striking distance and end the fight just as fast as it started with a knife. You can also (easily) pinpoint certain high-pain and sensitive areas of the body when using a knife, such as the eyes, nose and groin. This would be difficult with guns and other self defense weapons. As we said earlier, if you are being physically attacked the last thing you should worry about is the possibility you might kill your attacker due to the self-defense measures you applied to the situation. In situations such as these, it is killed or be killed. Now, if the person was merely trying to rob you, the situation gets a little stickier from a law enforcement perspective, but you still have the right to protect yourself (as you will read about in an upcoming section) if you feel threatened. All that being said, if you do protect yourself with a knife (vs. a gun), the chance of using lethal force is greatly minimized. In most cases an attacker will flee at the first prick of that knife, but even if he doesn’t it is much harder to kill someone with a knife than a gun. Knife owners have mixed opinions in the debate that pits fixed blade and folding blade knives against each other. So which is the right type of blade when your life is on the line? We will let you decide that for yourself. However, to help you make that decision, below we have listed the advantages and (and some of the disadvantages) of both folding knives and fixed blade knives. We will also offer our opinion based on this information. When it comes to choosing a fixed blade or a folding knife for self defense, each offers some advantages and drawbacks. Here we will take a closer look at each type of blade. Easy to Conceal. Folding knives, as the name suggests, can basically be folded in half. This makes them much easier to conceal, and prevents the whole world from knowing you are carrying a knife. Element of Surprise. Because of their easy concealment, folding knives have the advantage of offering the element of surprise. Easily transported. Folding knives are often referred to as “pocket knives,” because they are easy and safe to transport in the user’s pocket. Well-constructed. A well-constructed folding blade or pocket knife can be constructed with a blade that is just as strong as the ones made for fixed blade knives. Stronger/Won’t Break. Fixed blade knives are available in a wide variety of sizes, but one trait that seems to set these blades apart is the strength of the blade, guaranteeing you many years of use without breakage. They also have no moving parts to go wrong, which folding knives do. Easy to Maintain. Cleaning a fixed blade knife is easy and straightforward—you never have to worry about the hinge or the casing. Longer. On average, a fixed blade knife is usually twice to three times the size of a folding blade knife. Tactically Efficient. When time is of the essence, drawing a fixed blade knife from a sheath is much faster and more efficient than trying to unfold a pocket knife. Many Other Uses. As a stronger, longer and more durable survival tool, a fixed blade tactical knife is much better at non-self defense tasks such as cutting, digging, hunting, splitting, food preparation, first aid, prying, and hammering. While folding knives can be great for everyday situations, nothing beats a fixed blade knife for outside survival and self-defense. And if you are worried about having your knife exposed, there are many carrying options that can make these knives almost as discrete as the everyday pocket knife. The women reading this article may be disappointed and saddened to learn that knife defense is NOT appropriate when men merely hoot and holler as they cross the street, they cannot be used when men use bad pick up lines, and not even when men wear “Jorts—jean shorts” out in public—although that should be a crime. No, the offense/situation has to be much different and certainly much more serious before it is appropriate to draw and use a knife. In America, according to legal experts, “knives are considered deadly force weapons by the court; hence, they should only be used in situations where the individual reasonably believes he or she is in danger of great bodily harm or death, or to protect another from the same.” In the courts, great bodily harm is not always easy to define, but from a general standpoint, it can typically be defined as an injury that causes irreparable disfigurement or loss of function. According to those same experts, there are three factors to consider when determining if it’s appropriate to use a knife for self defense. They are: ability, opportunity and intent on the part of the would-be assailant. Does the person have the ability to cause you great bodily harm? His or her ability to cause you that harm can be ascertained by considering one of many factors: their physical stature, the presence of additional assailants, the presence of a weapon, etc. In other words, they must present with qualities or items that give them a distinct advantage over you. Opportunity can be defined as the “immediate opportunity to exercise the aforementioned ability or distinct advantage.” This is usually defined by the proximity of the attacker—is he or she near enough to cause great bodily harm or death, with or without a weapon. Finally, even if the attacker has the ability and opportunity to cause death or great bodily injury, a knife-based self defense solution is not warranted unless that person also demonstrates the intent to do that action. Intent can be determined by the individual’s words, actions or demeanor. Saying, “I’m going to kill you” is intent, and so is continuing to approach someone or accost someone after that person has told them to stop. All three of these factors—ability, opportunity and intent—must be present for any self defense measure that could be classified as deadly force—a category in which knife defense certainly falls.